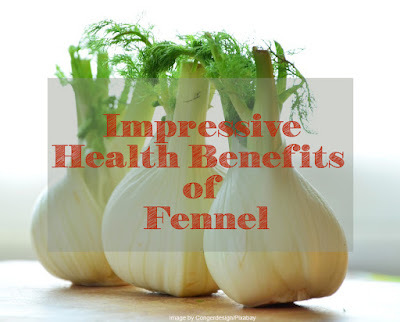 Home / Greenery / Herbs / Various Impressive Health Benefits of Fennel. Various Impressive Health Benefits of Fennel. Fennel is a type of flower plant originating from the Mediterranean. Fennel plant often used as kitchen spices in a number of dishes. Instead from being as a flavoring dish, fennel seeds have a myriad of health benefits. In culinary, Fennel can be eaten raw or cooked. Served as a fresh salad, and can also be boiled in a thick sauce. There are also those that make it by baking and served with vegetables and seeds. Fennel also used for various digestive problems including stomach ulcers, flatulence, loss of appetite, and colic in infants. This herb is also used for upper respiratory infections, coughing, bronchitis, cholera, back pain, urine problems, and vision problems. Fennel is also believed to be a galactagogue, which is a substance that is considered to aid breast milk (ASI). Part of this plant that is often to aid breastfeeding is the seeds and leaves. Fennel contains essential oils that can help the formation of digestive enzymes. This enzyme plays a role in the process of digestion of food in the body. Fennel also contains anethole which can help absorb various nutrients from food and reduce the inflammatory process (inflammation) in the stomach and intestines. Consuming fennel can also help reduce flatulence and gas formation in the stomach. Fennel can also help prevent constipation because it has a laxative agent. Fennel contains a lot of fiber which makes reduce cholesterol and fat levels in the body. Fennel contains many antioxidants and phytonutrients. It can help lower LDL cholesterol levels, and increase HDL cholesterol levels. Fennel also contains folic acid which can suppress the work of homocysteine which can damage blood vessel walls, and cause heart attacks. Potassium in fennel can also help lower blood pressure so it is good for heart health. Fennel contains various anti-carcinogenic substances such as various types of antioxidants, flavonoids, alkaloids, and phenols. Fennel seed extract also contains various anti-carcinogenic substances. Anethole is an anti-inflammatory agent found in fennel and is thought to inhibit the development of cancer. Quercetin and limonene contained in fennel can prevent breast cancer. Fennel is also known to help improve cognitive in a person. Potassium in fennel can help the electrical conduction in your body. Fennel is also very helpful in the process of delivering oxygen to brain cells, making these brain cells more active. Consumption of fennel can also help improve memory. Benefits of Fennel for Pregnant Women. Fennel is believed to increase the supply of breast milk for mothers who are breastfeeding. It is supported by a small-scale study which states that therapy with fennel can increase the amount of breast milk. However, some research is still needed to prove clinically the efficacy of fennel. If you want to try breastfeeding using fennel, you can do it in three ways. Fennel seeds can be brewed into tea. Eaten as cooked or raw vegetables. However, always consult with your doctor first about the way or rules of use and the risk of fennel side effects or the results of fennel interactions with drugs that are consumed. Is fennel safe for nursing mothers? Whatever consume by a nursing mother, it will also consume by the baby. How about fennel? Is fennel safe for nursing mothers? The FDA states that fennel can be categorized as a food that is safe and can consume by all adults, including breastfeeding mothers. According to the FDA, a small amount of fennel contain in breast milk does not seem to be harmful to the baby. Likewise, there are other studies which conclude that fennel is safe to use for babies, but it is recommended to use no more than 14 days. Its use must also be careful because if you consume excessive fennel, the effect can poison your child through breast milk. Babies have the potential to experience allergic reactions or poisoning from breast milk from mothers who consume tea containing excess fennel and herbal plants. It is recommended to avoid fennel if you have allergies to celery, carrots or mugwort plants. People who have bleeding disorders should also avoid it because fennel is thought to slow blood clots. The use of fennel is also best avoided by those who have conditions that are sensitive to hormones, such as those with ovarian cancer, endometriosis, breast cancer, or uterine cancer.